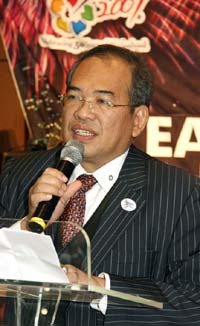 Director Abdul Mutalib Awang of Malaysia Tourism Promotion Board (MTPB) will host a special seminar on promoting golf tour in Malaysia at an exhibition center in the southern part of Seoul on March 2, 2007. "Malaysian Golf Seminar" will start at 10:30 a.m. on the day at International Conference Hall No. 1 of the Seoul Trade Exhibition & Convention (SETEC) in Daechi-dong, Gangnam-gu, Seoul for about three hour run. SETEC is located at Hakyeoul Subway Station on the orange Line No. 3. The special golf seminar is aimed at promoting golf markets of Malaysia among the Korean people on the occasion of "Visit Malaysia Year 2007," according to Director Awang. Mr. Awang also serves as chairman of the Association of National Tourist Office in Korea (ANTOR Korea). Prior to the seminar Director Awang will deliver a welcoming speech for about 200 high-profile guests of the local travel agents, travel-related associations, media people, and local golf personalities. The first presentation on the overall situation of Malaysia's golf market will be made by Pempena, a golf membership promotion arm of Malaysia Tourism Promotion Board (MTPB). The second presentation on the various programs of golf membership in Malaysia will be made by Malaysia Pass, a South Korean travel agent dealing with golf membership sales for Malaysia. Question and answer session will follow the presentations. Buffet lunch will starts at noon on the day. For details or inquiries contact Malaysia Tourism Promotion Board (MTPB) at 82-2-779-4422.